Wake up to a phenomenal view of the foothills of the vulcanic mountains of Auvergne. The sheltered location of your holiday home will make you full free and one with nautre. 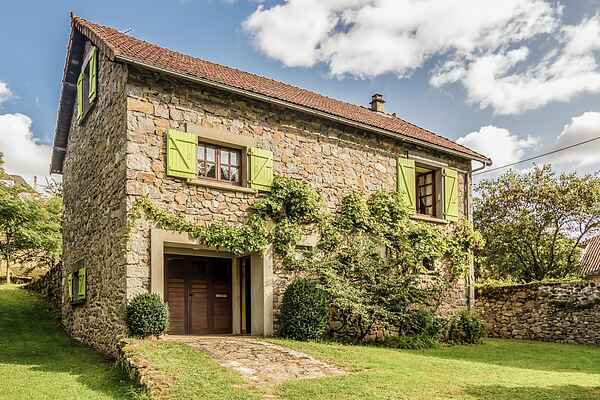 The house is situated on the edge of Bort-les-Orgues and looks out onto the forested hills. You can see the sunset and sunrise from your comprotable lounging chair in the spacious garden. Right near your holiday home are a number of special hiking and cycling routes ready for you. The pleasant centre of Bort-les-Orgues in the Parc des Volcans, belonging to the world heritage of the United Nations, is just 1 km away. Also visit the astounding Château de Val which lies along the sea. Here, at the beach, you can go swimming or just relax. A boat trip on the sea is highly recommended. In Bort-les-Orgues you are also in the right place for weekly markets, nice outdoor cafés, the supermarket, a good bakery and incredible local cooking. In the nearby Auvergne there are countless castles and pretty churches. For example, in Auzers (22 km) and Marlat (4 km from Auzers). Wonderful shopping opportunities in Ussel (25 km). Other pretty villages worth visiting are Riom-lès-Montagnes (26 km) and Sourniac (27 km). The house is rented exclusively to one or two people!